The Economic Development Association of Alabama (EDAA) is a network of Alabama economic development professionals. 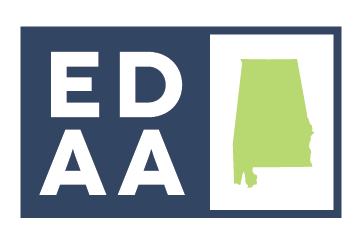 Currently, EDAA has 500 members, including directors and staff members from local economic development associations, as well as other individuals involved in economic growth in Alabama. Our members enjoy the benefits of networking opportunities, professional development and legislative representation. Alabama economic developers are tasked with improving the quality of life in Alabama and understanding what drives businesses to call Alabama their home. Economic development brings business and industry together in order to improve the economic, political and social well-being of Alabamians alike. These sizeable challenges work best when matched with economic strategies at state and regional levels in order to ensure priorities and progress remain at the forefront. EDAA will purposefully advocate issues which can positively impact the economic development community and profession in Alabama through legislation and professional development. EDAA is the premier organization for economic development professionals in Alabama.